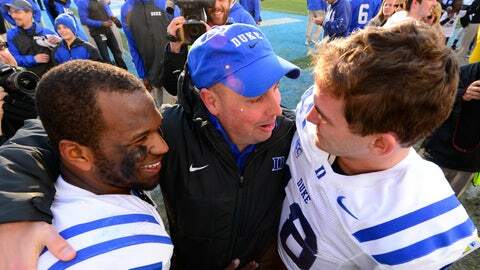 With Kurt Roper (center) as offensive coordinator, the Duke Blue Devils ranked 59th in the country in rushing offense and 63rd in passing offense in 2013. GAINESVILLE, Fla. (AP) — Kurt Roper’s lengthy interview at Florida must have been impressive. Roper has agreed to leave Duke to become the offensive coordinator for the Gators, according to a person familiar with the situation. The person spoke to The Associated Press on Tuesday night on condition of anonymity because the hiring has not been announced. Roper spent several hours with Florida coach Will Muschamp in Gainesville on Monday. He is expected to remain with the Blue Devils through the Chick-fil-A Bowl on Dec. 31. ESPN was the first to report the decision. A Florida spokesman declined comment when reached by The Associated Press. Roper replaces Brent Pease, who was fired the day after Florida (4-8) completed its first losing season since 1979. Florida’s offense ranked 112th nationally — the third straight year it placed 100th or worse. Muschamp also fired offensive line coach Tim Davis. If Florida doesn’t show significant improvement in Muschamp’s fourth year — he is 22-16 through three seasons — athletic director Jeremy Foley certainly will clean house. Muschamp had been expected to interview several potential candidates, a couple even after the bowl season. But he wasted little time offering Roper the job, although many believe Southern California’s Clay Helton was Florida’s top choice. Helton decided last week to stay at USC under new coach Steve Sarkisian. Roper, meanwhile, followed coach David Cutcliffe to Duke in 2008 from Tennessee and helped rebuild the Blue Devils from one of the nation’s worst power-conference programs to the champions of the Atlantic Coast Conference’s Coastal Division. Roper was a finalist this year for the Broyles Award, given to the nation’s top assistant coach. The offensive coordinator helped the 22nd-ranked Blue Devils (10-3) set a school record for wins and earn a spot in the Chick-fil-A Bowl. Before joining Duke, Roper coached at three Southeastern Conference schools — Tennessee (2006-07), Kentucky (2005) and Mississippi with Cutcliffe (1999-2004). So he has extensive SEC experience, having coached quarterbacks at Kentucky and Ole Miss, and running backs at Tennessee before arriving in Durham, N.C. In addition to his role as offensive coordinator, he has served as assistant head coach and quarterbacks coach at Duke. Florida is looking to change its offense from a pro-style, run-oriented scheme to an up-tempo system that features more spread formations. The Gators managed just 279 yards in a 26-20 loss to lower-division Georgia Southern on Nov. 23 and then 193 in a season-ending 37-7 loss to Florida State. Florida lost its final seven games and missed a bowl game for the first time since 1990. The Gators threw just four touchdown passes during that losing streak. Over the last two seasons, Duke averaged more than 30 points per game. Duke averaged 408.1 yards and 31.6 points this season, ranking sixth in the ACC in both categories.